I was looking through the forum for this cup. I found a 3610 in the gallery as a tall cup. This one is 70 mm high and is only impressed "Made in New Zealand" It is vitrified. I noticed most of this pattern is in the 700 range gallery. I think TALL refers to SHAPE and PROPORTION rather than SIZE Mike. The other hotel cups are the Carlton 755, the can 782, the demi 773, and the tulip 863. Good point about 3 and 4 digit numbers. I don't see anything in 700s or 800s that could be an earlier number for this cup. If you find an example of this shape that predates 18.3.64 then a re-think will be needed! 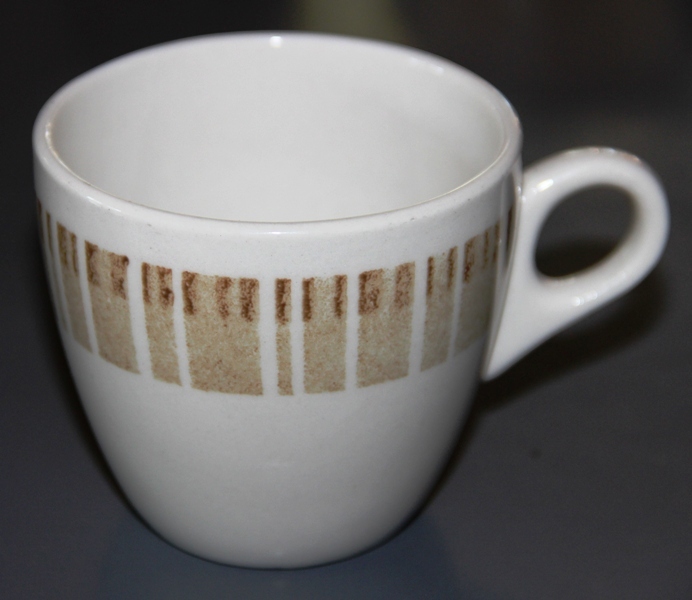 You will notice that this is the very first of the vitrified 4 digit cup numbers and therefore must have been one of the first allotted under the new 4 digit numbering that began in 1964, indicating the likelihood of a totally new design. Existing 3 digit shapes were not automatically given new 4 digit numbers. The Cook & Serve can never got a 4 digit number, and it appears that it's supposed successor, the 3618 dated 1968 never really caught on, with the only example yet to appear being the Reflections cans I have posted. It is likely that the other hospital/hotel shapes already existed as 3 digit numbers in 1964 and if or when their numbers changed it was much later on.